Good morrow to you all! There is a bonus post this week. As you know, Ian Livingstone did a book signing in Forbidden Planet in London, but he also did a signing anda presentation at the Edinburgh Festival on the 11th August. 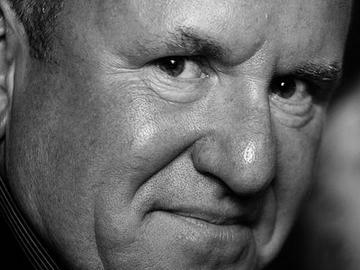 Writer of awesome fiction and contributer to the upcoming Way of the Tiger RPG, David Walters popped down and was kind enough to write up his visit with Ian Livingstone for my blog. Many thanks David :)! Ian Livingstone OBE is a busy man, currently life president of Eidos for Square Enix, and has been campaigning for tax breaks for the gaming industry and for educational reform in computer science in schools. Despite all this, he has made a point of finding time for Fighting Fantasy. One week after a well-attended book signing in London, Ian was in Edinburgh as part of Edinburgh Interactive (an event about interactive media and entertainment). His busy schedule in Edinburgh also included an International book festival appearance and hosting an international culture conference at the Scottish Parliament. I attended the free event at Edinburgh Interactive, and after a successful luck roll I was fortunate enough to come across Ian alone in the hotel preparing for the event. “What first attracted you to Fighting Fantasy?” Ian asked me as we were chatting about how I first came across his books, his gaze shrewd. Off guard, I mumbled something about the brilliant artwork on the covers. “But once you had read it, what attracted you to it over other gamebooks?” he pressed. It was a hard question to answer. Ian looked as if he was still seeking that answer himself, so he could trap it like a genie in a lamp. There seemed to be no single answer as to how Fighting Fantasy captured that mysterious, elusive ingredient that was key to success. 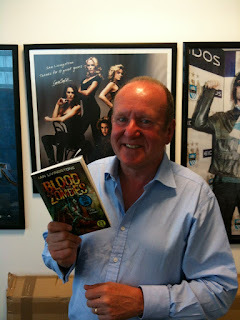 Ian was keen to stress that the Blood of the Zombies was not a commercial enterprise, but rather homage for the fans, a labour of love to mark the 30 year point in the series. It is clear Ian dearly loves the series, and yet his commercial instincts still cannot help but to shine through. I mention I am a writer, and he is quickly asking me about genre, type (novel or gamebook), and crucially sales. I get the feeling that Ian likes to keep his finger on the pulse of what is hot and what isn’t, always seeking the newly emerging market. What of the absence of Steve Jackson? Ian admitted he found it hard to get Steve as enthused about writing an anniversary edition, despite stressing that Fighting Fantasy is (and always will be) dear to Steve’s heart. I got the impression that the positive reaction to Blood of the Zombies may have surprised Ian a little, and will no doubt be something he will refer to in order to draw Steve back into the next writing project for Fighting Fantasy (more on this later). It took Ian more than two years to write the new book, whereas in the old days it used to take him a little over two months, and he described writing the new one as ‘challenging’. It was clearly a labour of love, since he has such a busy life now that the writing had to be done late at midnight or 6am when he could squeeze in the time. He chose the theme due to the consistent popularity of zombies in culture, and that no other Fighting Fantasy book had covered them in any depth. He chose a medieval castle as the setting to straddle the fantasy element with real life that would allow a variety of modern weapons to be used against the zombies. It was Ian’s first book of the series not set in the fantasy world of Titan, so this represented a level of risk for him. Ian insisted that the publisher have a green spine to the book for nostalgia. He was unsure who he should aim his writing at: the child of today or the one who had long since grown up but still loved the books. He found a compromise - he slimmed down the combat rules (dropping skill and luck) to try to appeal to today’s ten year olds, whilst maintain the book as ‘stupidly difficult’ to appeal to the forty year old reader. Like a computer game, the gamebook had collectibles and easter eggs. Ian sees the fact that you have to kill all of the zombies to truly win as being like a computer game where all collectibles must be found, which may appeal to children who play games in that way. Easter eggs in the book included references to Zagor’s birthday, a nod to pencil and dice, and much more. Ian also was able to use social media for the first time when creating this book, and this had the advantage for him of finding out more directly what people wanted. More than a thousand people voted online to choose the name of the book, and more than half a dozen people on twitter who won a competition got to have their name appear in the book. Writer and actor Charlie Hickson also got his name in the book by special request, as did Member of Parliament Tom Watson – clearly Fighting Fantasy still matters to those who have grown up with it whatever their vocation. 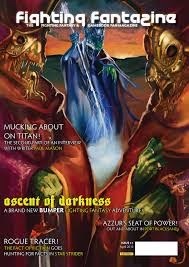 Ian describes it as ‘amazingly gratifying’ that Fighting Fantasy still resonates with people. The audience were shown several slides of concept art for illustrations in the final book. One of the slides shown was of the original cover art for Blood of the Zombies, and compared with the final cover in which the colours had been brightened through Photoshop to maximise the effect. Such technology use in art was not available before, and was a way in which Ian could use it to enhance the final effect. In terms of artwork Ian described himself as a nightmare to work with, very attentive to detail. Typically an interior illustrator will not get to play through the gamebook, but instead will get the background introduction of the book, the paragraph the illustration relates to and in Ian’s case copious notes of how it is to look. Tin Man games is producing an app of the book which is due for release in late September. It will not just be a straight copy of the book either – and will contain its own unique twists. We were privileged to see a slide of artwork that appears only in black and white in the book, but is beautifully rendered in colour for the app (a zombie holding a grenade). Ian recommended that everyone by the book to place pristinely on their bookshelf for the collection, and then buy the app to play the game on the way to work. Who are we to disagree? At the time of writing, Blood of the Zombies has sold out of print copies within 3 days and reached as high as 80 in the amazon sales chart – and the digital version is not even out until the end of September. The notoriously tough Eurogamer reviewed the book and gave it 9 out of 10. Clearly Steve Jackson’s Sorcery isn’t the only thing that still contains the old Fighting Fantasy magic. Ian’s book signings have been very successful and led to him hearing so many stories as to how the series inspired others, which Ian describes as ‘humbling’. Would Ian write any sequels? This was a topic touched on several times by the audience. He would consider a sequel to Blood of the Zombies if it really took off. Would there be another sequel (after Trial of the Champions and Armies of Death) for Deathtrap Dungeon? ‘Possibly’ Ian said. What about a sequel to City of Thieves? Ian admitted that it would be something he ‘might consider’. How about a sequel to The Legend of Zagor using the same impressive four-player combat system? Ian ruled this out as complicated, and said the questioner was welcome to write that one themself! He did state that he is hoping to do a 40th Fighting Fantasy anniversary book with Steve Jackson, and that given it was a joint venture it would likely involve Firetop Mountain. Did Ian sense that the 40 year olds of today were getting their kids into Fighting Fantasy, thereby bringing it to a new generation? This was my question and something close to my heart given my desire to get my son into reading gamebooks when he is old enough. Ian was certain today’s ten year olds had no free time to learn any complicated rules for a gamebook (although he did say many of today’s forty year olds did cheat anyway when younger when it came to the rules). Today’s ten year olds would likely respond better to a story with a simple branching narrative and no rules, whereas today’s forty year old Fighting Fantasy fans wanted and enjoyed more complex rules. Ian commented that he wasn’t sure the rules so painstakingly created by him and Steve were needed, since most people seemed to cheat through the books. He also highlighted how important it was to have items to collect, so that the powerful imagination of a child felt as if they were the character in the book, and not just reading about a character in a book. Was Ian worried about the content of the books for children? From his considerable experience, Ian said he was aware of where to go and where not to go in children’s fiction. He said children know the difference between fantasy and reality, and as long as the themes are about fantasy elements and not real world problems they will get the distinction. He was asked as a follow up as to whether his work had ever been ‘watered down’ for foreign markets. The series is in thirty different languages, so Ian confessed he did not know, but recalled one example of where a horrible death scene had been heavily sanitised for a foreign market. Would Ian consider writing a digital gamebook without the limitations of a paperback book? Ian admitted he was set in his ways, using pen and paper to create a flowchart for all his gamebooks. He does not foresee this changing. Which gamebook is Ian most proud of? Overall, it was Warlock of Firetop Mountain as it launched the series. For ones he wrote himself, Deathtrap Dungeon, City of Thieves and Blood of the Zombies. What would Ian have done differently about the books he wrote? Ian was happy with the books he had written as they were all the best he could do at the time, although he did concede some were naturally better than others. He also mentioned that the world of Titan was something of an afterthought following the unexpected level of success of Warlock, but this was resolved in future books to give a coherent game world. Did Ian have a sense of competition with Steve when writing gamebooks individually? Yes he does, but emphasised it was a friendly and healthy competition (comparing it to Britain’s Brownlee brothers who competed in the men’s triathlon at the Olympics). Both he and Steve did ‘keep an eye on’ their own and each other’s level of sales. Also, this friendly rivalry was good for the series, as they each spent more time perfecting books on the series than they otherwise would have. Steve liked to write more quirky aspects in his books and have different settings whereas Ian liked to stick to ‘orcs and swords’. 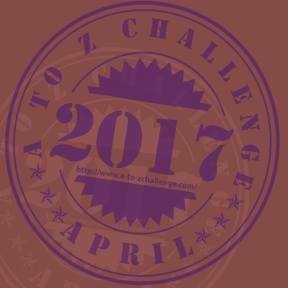 Is it harder to write games or gamebooks? Games were the more challenging, as they involved a team of two hundred people and had to blend ideas with technology. It was easier to make a difference when you are just a team of one. Does Ian have a rule of thumb when designing the difficulty level of a book? It was hard to find the right balance of difficulty versus fun. Ian’s advice was to simply write the book first, then identify the optimum route through it (the true path that even those with low stats should be able to succeed at), and then make that optimum route fair. Is it easier to write a novel or a gamebook? Both are difficult, but he finds a gamebook slightly easier as you can satisfy the reader more easily with rules and monster encounters. What other books is Ian working on now? Does he have any unfinished gamebooks? Ian has a gamebook written a while ago that is only ten percent complete, but had no further details on it. The big news from Ian was that he had written a fantasy novel, which an editor was impressed with and just needed a rewrite of the early chapters to set the scene. This was last reviewed in 2008 and he had to set it aside to start work on Blood of the Zombies. He had never spoke of the book publicly before now, and believes it will be published someday. Ian made it clear that he wrote Blood of the Zombies to delve into the childhood legacy of the fans, hoping to find something that resonates with them. From the feedback in the room, he has clearly succeeded. Ian has co-created a legend with Steve Jackson. He thought he was creating a zombie book, but he has actually brought the Fighting Fantasy franchise back to life in zombie form. He admits he really enjoyed writing it (despite the crashing of his laptop that lost him 20% of the book). ‘If people still want to buy Fighting Fantasy, even not to the same sales figures as before, I am happy to write more,’ he says. Before the release of the book, Ian thought the series ‘had had its day’, but he still wanted to write something for the fans - the level of sales has been a pleasant surprise to him. Fighting Fantasy is not as alive as before, but it is moving and very hard to stop. I've always wondered how he managed to write these books in such a short amount of time, they seem so complicated to write! It was Ian’s first book of the series not set in the fantasy world of Titan, so this represented a level of risk for him. Did he go into any detail about which death scene this was? Good point about Freeway Fighter - that seems to have passed me by. Ian did emphasise in the talk the risk of setting it in the modern day as he is clearly a sword and sorcery man. Ian didn't recall the book with the changed death scene, but said the death scene had been something akin to being slowly devoured by a horrible monster but had been changed to the equivalent of simply fainting. A bit of trivia relating to horrific gamebook scenes: when Jamie Thomson was writing his part (the first half) of Keep of the Lich Lord, he got a comment back from Marc Gascoigne at Puffin that one of his death paras was "too lurid and violent" and that "the most effective horror is understated and subtle". Jamie had to write back saying, "It's Fighting Fantasy, not The Woman in Black!" That is classic, Dave, and well done Jamie for standing up to the women in black brigade! Happy 30th birthday Fighting Fantasy!